People march in support of Palestine in Cape Town, South Africa, May 15, 2018. South Africa has downgraded its relations with Israel, turning its diplomatic mission into a liaison office and not sending a new ambassador to Tel Aviv. In a recent address to the South African Institute of International Affairs in Johannesburg, Minister of International Relations and Cooperation Lindiwe Sisulu announced that "stage one has been completed” in lowering ties with the Israeli regime. 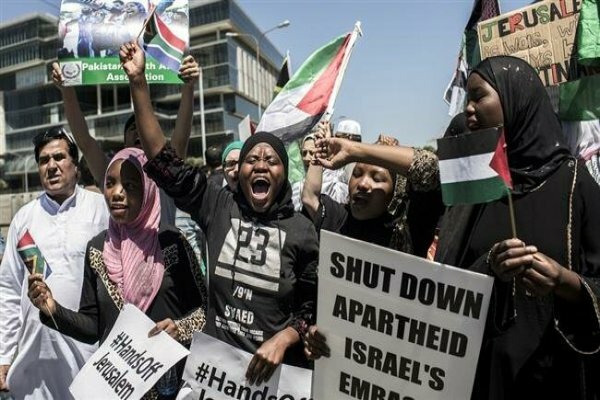 South Africa, she said, had demoted its Tel Aviv embassy to a liaison office with limited functionality and would not replace its envoy to Israel, who was recalled last May in protest at Israel's deadly crackdown on Gaza anti-occupation protests. In December 2017, South Africa's ruling African National Congress (ANC) party decided to downgrade the country's mission in Tel Aviv in an expression of "practical support" for the oppressed Palestinian people, warning Israel that it should pay the price for its "human rights abuses and violations of international law." President Cyril Ramaphosa says South Africa is planning to downgrade the status of its embassy in the occupied territories in response to Israel's violation of Palestinians' rights. The Israeli foreign ministry, however, reacted to South Africa’s decision only by saying that "We heard this and are examining the implications."